Microsoft Azure Government regions give unparalleled flexibility for US government agencies and their partners. Today, we announce the general availability of industry-leading performance Azure SQL Data Warehouse Compute Optimized Gen2 tier for government customers in the US Gov Arizona and US Gov Texas regions. Azure SQL Data Warehouse is a fast, flexible, and secure analytics platform offering you a SQL-based view across data. It is elastic, enabling you to provision a cloud data warehouse in minutes and scale to terabytes in minutes. With Azure Government only US federal, state, local, and tribal governments and their partners have access to this dedicated instance that only screened US citizens operate. Customers can choose from six government-only datacenter regions, including two regions granted an Impact Level 5 Provisional Authorization. Moreover, Azure Government offers the most compliance certifications of any cloud provider. 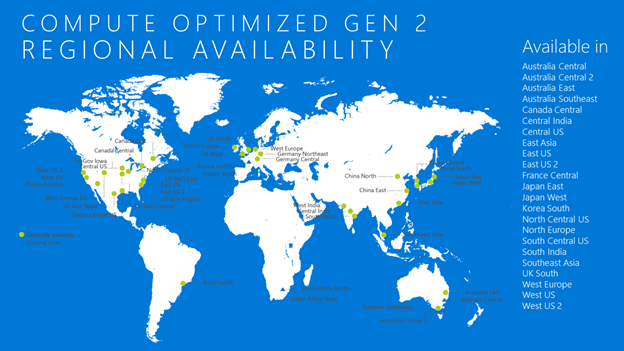 These new locations bring the product worldwide availability count for Compute Optimized Gen2 tier to 28 regions. Azure SQL Data Warehouse Gen2 brings the best of Microsoft software and hardware innovations to dramatically improve query performance and concurrency. Our customers now get up to five times better performance on average for query workloads, four times more concurrency, and five times higher computing power compared to the previous generation. Azure SQL Data Warehouse can also serve 128 concurrent queries from a single cluster, the maximum for any cloud data warehousing service. With SQL Data Warehouse in Azure Government, federal customers can get world-class security, protection, compliance, and modernize their legacy infrastructure to a flexible, hybrid environment. Begin today and experience the speed, scale, elasticity, security, and ease of use from this cloud-based data warehouse for yourself. You can always find more information by reading about the capabilities and features of Azure SQL Data Warehouse. You can also connect with us if you have additional product questions via StackOverflow or our MSDN forum. Download and get started with your complimentary Azure Government Trial today. Request your free 90-day trial today, or check out purchasing options to get started now.